In that article, Lapse Pi -Motorised Time-lapse Rail with Raspberry Pi, I showed you some simple python code to drive the time-lapse rail by running the script from a laptop or smartphone capable of ssh’ing into the Raspberry Pi. Update: Be sure to check out the latest revision based on an ESP8266 MCU with Wifi Hotspot. 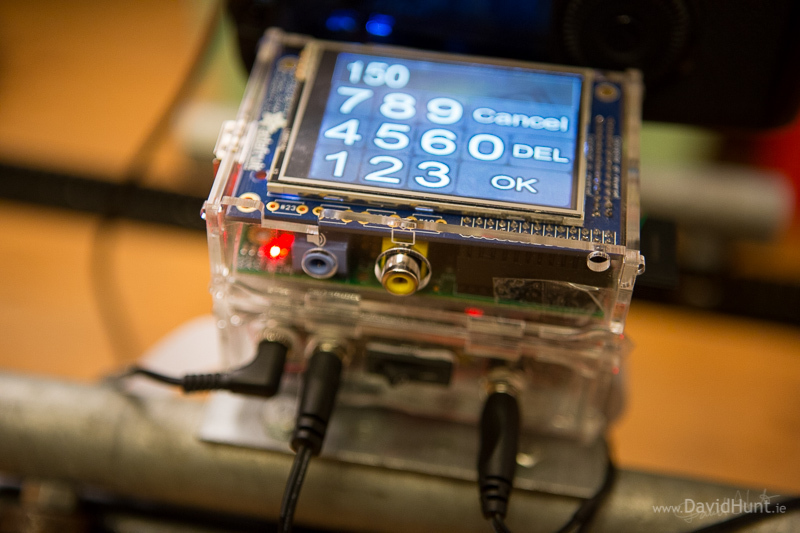 The PiTFT allows me to take the project up a notch, by putting the user interface right on the Raspberry Pi, so no external device or connectivity is needed. Here’s a picture of the setup. And it’s all done using a few simple screens with a simplistic, easy-to-use touchscreen user interface. The following video shows it all in action. As you can see in the video, there’s now a motor controller circuit in the mix to allow me to change the direction of the motor from software, rather than having to use a switch. $10 Misc Connectors, transistors, etc. Total for the controller – round about $100. Originally I had a laptop connected to the Pi via Wifi, and later on I had a smartphone do the same, but then I got my hands on a PiTFT, a shield that sits neatly on top of the Raspberry Pi. When I saw it on the Adafruit website, I knew I had to be quick, so 5 minutes later I had one on order, and five minutes after that they were out of stock. Shipping took a while, the order went in before Christmas, and to be fair to Adafruit, the package shipped the next day, but it took over a month to get here from the States. Small packages are usually a lot quicker than that. Anyway, when it arrived I started researching the best method to develop a Time-lapse User Interface. I looked a TKinter, and did a few sample apps. This was more suited to Xwindows development, and the controls were all very small and difficult to use with just your finger. Limitations in the controls also meant it was difficult to size them up to be suitable for the 2.8″ display. So I came to the conclusion that TKinter was not a suitable development environment for my needs. 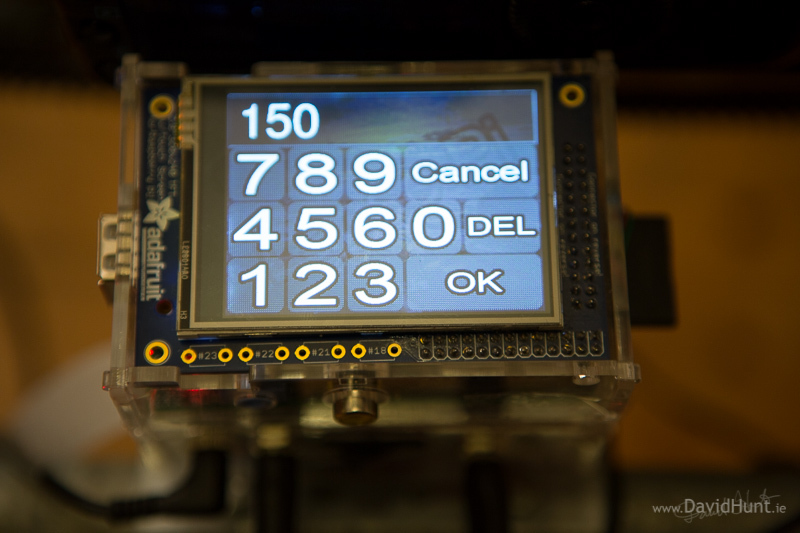 Then I came across the excellent “DIY WiFi Raspberry Pi Touchscreen Camera” tutorial on Adafruit’s website by Phil Burgess. It’s implemented using PyGame, and the GUI looked really slick and simple to use, so I got my hands on the software, installed it and got it up and running. And the amazing thing is that it was all done in about 647 lines of Python! So, I dove into the guts of the code and saw that it was a very elegant method using PyGame to display icons on the screen and allow actions to happen when those icons are touched. Ideal for a simple user interface of a couple of screens, which is what I’d planned for the time-lapse GUI. So I set about tearing it down and adapting it for my needs. One of the main challenges was doing a numeric keypad entry. That would require lots of icons, and a method of displaying what the user was typing. So I started on that one. Photoshop is great for throwing icons together, and putting fancy effects on fonts, so I used something similar to the Adafruit Camera’s font, a white font with a thick black stroke, and a checkered, semi-transparent background for the touchable icons. 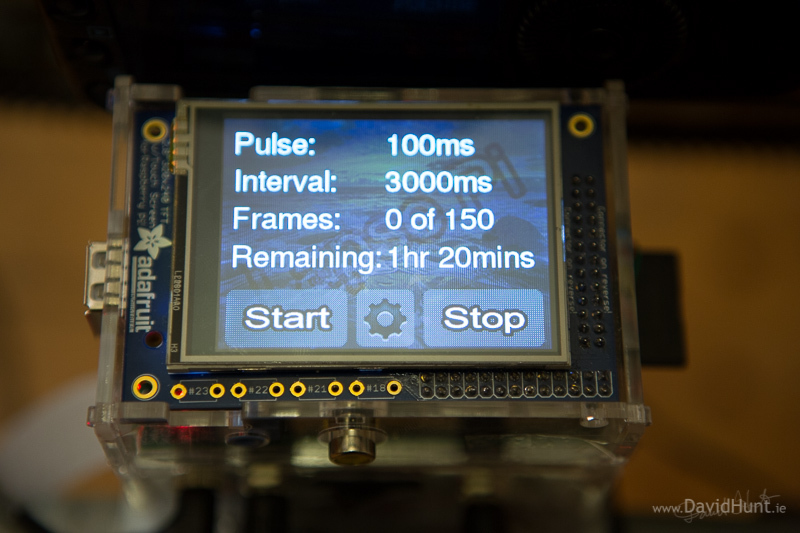 Next was the screen for the main display, which is what’s shown to the user when the time-lapse is running. This allows the user to start/stop the time-lapse, with another button for settings. Everything else on the screen is just information on the current status of the time-lapse. For each numeric setting, there’s a touchable button which brings the user to the numeric keypad entry, where they can change the value passed in. There’s also two buttons for motor control, one for motor direction, and one to drive the motor. This is used to get the camera dolly into the correct position at the start of the time-lapse. Once you start a time-lapse running, it runs in a background thread, so you can continue to move about the screens and change settings. If you change any of the settings, they will immediately be reflected in the running time-lapse. I’m not so sure this is a good idea, so I might change that. Also, the motor buttons can also affect the movement of the dolly, so I think I’ll disable those buttons while the time-lapse is running. The code is available here on GitHub, with installation instructions and prerequisites. It also includes all the icons needed for the touch screen interface. Documentation is generated from the docs directory on Github, but can be read here on ReadTheDocs.org. This includes a User Guide. Here’s some of my recent work. This was not done with the touch version of the time-lapse controller, but it does give you an idea of what can be done with this system. 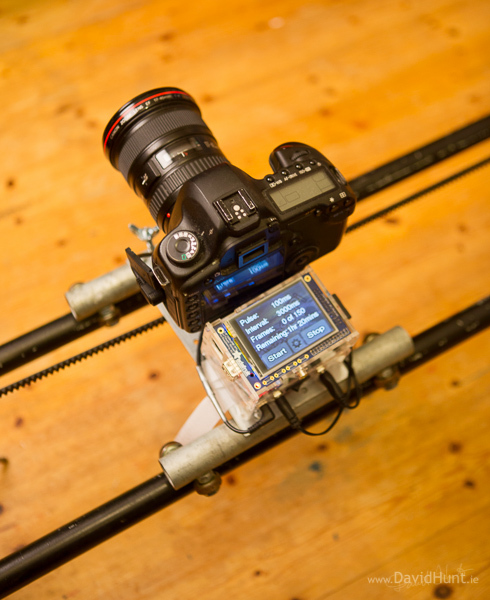 Most of the footage in this video was shot using a Raspberry Pi controlling the time-lapse rail. Great video Dave 🙂 Reminds me of the sort of stuff they do on programmes like Frozen Planet etc. every bit as good too. That must be weeks worth of work. Brilliant stuff. Great stuff again as usual David. Something I am definately going to do, but using my own design 2.8″TFT (of course 😉 ). Yes, Lewis. You could just have the circuit to drive the shutter on the camera, and leave out the motor driver. 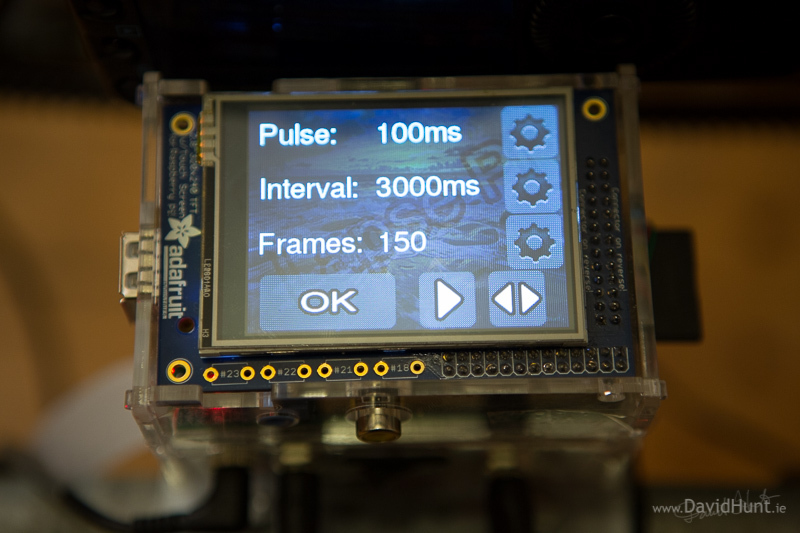 I am attempting to covert your python code for my TFT display board, which although is based on the same TFT module, uses a GPIO pin for the backlight rather than via a control bit like the adafruit you are using. I,ve got the screen working OK, but for some reason, I cannot get any life out of the configuration page – pressing any of the ‘buttons’ does nothing, including getting back to the main page. Note I haven’t connected up any additional hardware at this stage, but that shouldn’t matter as they are connected to the Pi’ outputs anyway. So i am unable to change the Pulse, Interval or Frames value as it doesn’t enter the numeric keypad. I haven’t needed to change any of that code, so i am a bit stumped. Texy, stick in a print statement around line 425 where it gets the MOUSEBUTTONDOWN event. If you’re not getting the event, then its something to do with the driver or touchscreen drivers. Thank you for the reply David. I get a print statement when i press the config button from the main menu, but nothing after that……..
Just to confirm i have 2 issues, which may be related. When the program first runs, I can START with the default parameters. I can also STOP it. However I cannot restart it, or enter the configuration page thereafter. When the program first runs, I can enter the configuration page, but not exit it, or change any parameters. Can you try running it from an ssh session? You’ll see if it bombs out, and the screen may not be going back to the console if it is crashing. You might have it ctrll-c during screen init when starting remotely. That’s how I have been connected, but I have also tried locally. It doesn’t appear to bomb out at all. FYI I have also modules the code to allow local quitting by hitting the escape key with the keyboard. That gives me a thought – perhaps having the keyboard connected is causing the problem. I’ll try removing it…. 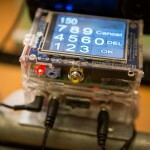 Your code uses GPIO17 for the shutterpin, but my screen uses that for the touch panel IRQ, so it clashed. Once I changed the shutterpin GPIO to an unused one it all sprang into life. One other thing I,ve noticed is that when the sequence has finished, and you want to start it again, you need to STOP it in order to reset the FRAMES to 0. That’s great Texy. Good to hear! I’ll make a note of the counter reset problem, and push a fix to GitHub later. Will do once i get it up and running. The electronics side of things I have no problem with, however I can’t use my hands for toffee, so the rails, trolley etc are more of a challenge for me.. Currently looking into Meccano as an option …..
Incidently i’d like to make a donation, but the Donate button just goes to the paypal website, at least it does for me using Chrome. I changed a few things today. Fixed the bug Texy mentioned above, now can start repeatedly. Timings were off, and Remining field is now being updated. Also change the Play/Reverse mechanism for the motor to be a simple Left/Right. Makes more sense to me. Your timelapses look amazing! I’ve tried creating some of my own using the Pi and the camera board. However, I haven’t found a method of compiling them into a video that I’m happy with yet. How do you go from jpeg to avi? Do you use command line tools or proprietary software? Any code you can share would be much appreciated! Thanks! Andrew, I’ve one word for you – “VirtualDub”. It’s a great little piece of software, ideal for assembling frames into videos. Saves out as AVI, but you can convert afterwards using whatever software you like. Oh, and to edit the videos I use Cyberlink PowerDirector. The €89 version. You can use the pi to compile video from jpg too, using mencoder. Of course it may be slower than your average PC….. Saw this article on the Raspberry Pi home page, just wanted to say how much I loved this timelapse, absolutely stunning and no matter how many times I watch it, I never got bored. Yes, the PiTFT has another GPIO connector on one side, so you can pass through the GPIO pins from the Pi to external devices. That’s what I’ve done here to control the motor and camera. You are right about the hard shutdown, I’m in the process of adding a button the TFT (the buttons arrived last week), so that when I press it, it will do a soft shutdown, then I flick the switch to cut power. Actually I am re-building your controller. I want to add some more buttons on the screen and extend the functionality. For this I would like to know how you created the icons. Can you please tell me what kind of font yu used etc? Really fascinated by this project as I have built a time lapse rig myself and am in the process of releasing a new controller firmware update for my original controller + currently working on a 3 axis rig that has traverse, tilt and pan. To date I have been using ATMega chip based controllers (similar to Arduino) but having just brought a Rpi B for another project I started to think about a pi based HyperLapse controller with touch screen and low and behold I found yours. Thanks for sharing this info as you have taken many hours off my development time. What a fantastic job you have done – looking forward to having a go with this controller and seeing more of your work. Wow!! I love it, the touch screen looks really class! You are a genius! I’m writing about it on my blog anyway! Gota get out and do lots of trials! Your time-lapses are an inspiration, well done! Thank you so much for sharing this. I have one question. I have followed all your steps, but when I launch the lapsePi software, I cannot interact via touch screen. Loading script says “Selected device is not a touchscreen I understand.” Any suggestions? The touchscreen does work otherwise. Patrick, have you gone through all the PiTFT setup, including the calibration steps? That may be because of having a mouse or keyboard connected. It is related to the eventX number will be different due to additional input devices fitted. Hi David. Awesome project. Forgive my ignorance. I’m a noob at all things pi. Is there a way to run this program without a touchscreen (just using the HDMI monitor)? What modifications to I need to make? Thanks again. Truly fantastic.